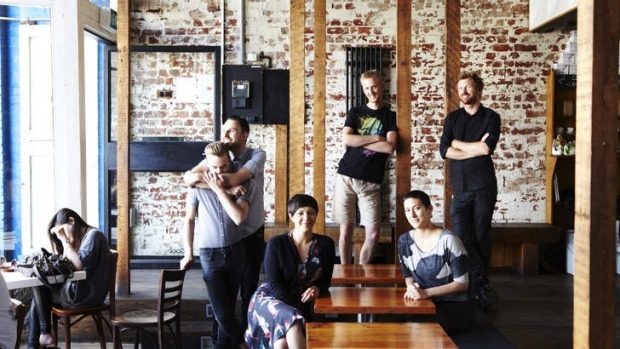 North Melbourne's Auction Rooms has been named Melbourne's best cafe in the 2013 The Age Good Cafe Guide awards, announced tonight. The Errol Street business has been at the forefront of Melbourne's increasing coffee fixation, serving customers its own Small Batch coffee roasts from beans sourced from the world's best coffee-growing regions. Editor of the The Age Good Cafe Guide Matt Holden said Auction Rooms' friendly staff, excellent brunch menu and picturesque interior hadn't hurt its cause either. "It's like a movie set for a cool cafe," Holden said. Other winners include Hawthorn's Axil coffee roasters (best coffee) and Richmond's Top Paddock (best new cafe) while the Cup of Truth's Courtney Patterson was named Melbourne's best barista. Coffee pioneer Giancarlo Giusti was given the 2013 Hall of Fame award for helping introduce the city to quality espresso through the establishment of his legendary Carlton business Grinders 50 years ago. 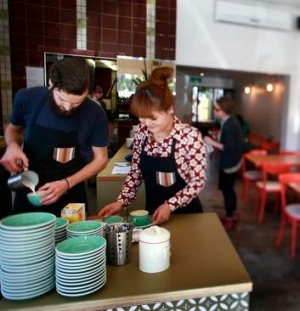 Cheerio in Richmond was named Melbourne's best small cafe and Matt Holden said the tiny space, which offers customers a single-page menu, was symbolic of a new breed of tiny cafes cropping up in inner-Melbourne. "There's an increasing number of cafes serving coffee-only or coffee and minimal food," said Holden who pointed to the CBD's Patricia Coffee Brewers as a cafe that helped spark the trend. Another trend identified in tonight's awards was the growing number of great cafes in Melbourne's east, such as The Resident in High Street, Ashburton, which was singled out for this year's Local Hero award. Holden said The Resident was just one of several quality cafes popping up in areas such as Bentleigh, Burwood and Ashburton. Owner of six-month-old business The Resident, Clare Hu, said she had identified the leafy eastern suburbs as being the perfect spot to open a cafe. 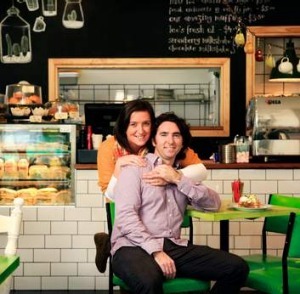 Hu, who has degrees in accounting and finance and is now also studying risk management, said she realised the eastern suburbs were crying out for decent cafes when she moved to Balwyn in 2005 and had to travel to Fitzroy and Richmond to "get a decent coffee". While there are "seven other cafes" on her bustling section of High Street, The Resident has carved out a niche selling specialty, single origin coffee and meals like sugar-cured salmon with samphire and potato rosti. Like Hu, married couple Damien and Seona Breen saw dollars in the caffeine-starved strips of Burwood when they opened their cafe last year. Foodrinkery, which backs onto a leafy park and sits opposite a primary school not only attracts young parents but students from nearby Deakin University. Like Hu, those students may have once ventured into Richmond for their coffee fix, but not now. ‘‘The whole community has really gotten behind us,’’ said Damien Breen. One of the coolest fitouts in town, excellent coffee, a tight brunch menu and smart service. We've had plenty of ''ah'' moments this year from Axil's seasonal blend, and their single origins, too. So many good cafes opened this year: Top Paddock is the best, with a sharp fit out, good food, great coffee and passionate service. With chef Andrew Gale in charge of the kitchen, St Ali's creative riffs on cafe food just got better. The Maling Room's blends and single origins are popping up at coffee-smart cafes all over town. Owner and head roaster Andrew Lew has been producing excellent coffee in Canterbury's lovely old post office since 2006. A lovely new space with a friendly team serving quality espresso and filter coffee. Small and perfectly formed, from the single-page menu to the Seven Seeds coffee and the chilled service. There's nowhere to hide at the former ticket booth that Patterson has called home for the past four years, pulling shots for the Flinders Street commuter crowds. Every suburb deserves a bright-and-breezy cafe with inventive food, ace coffee and a friendly vibe. That's The Resident in a nutshell. Fifty years ago, Giancarlo Giusti opened Grinders in Lygon Street. He also created the original Mario's blend in 1986. The Age Good Cafe Guide 2013, is on sale for $5 with The Saturday Age this weekend. It's also available in bookshops and online for $9.99.